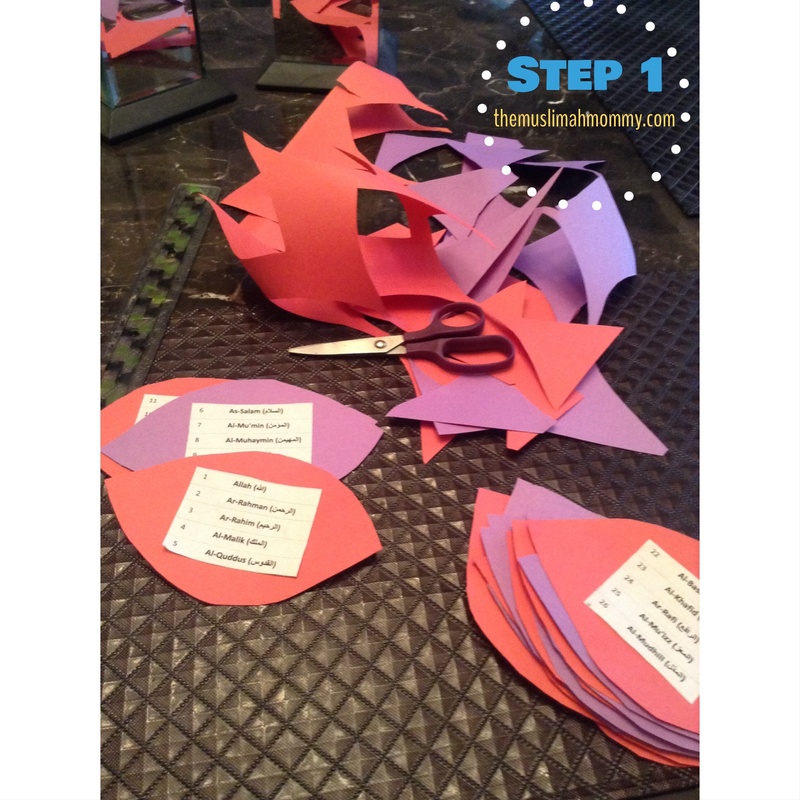 I wanted to teach my daughter the 99 names of Allah in a fun and creative way, and turning this learning activity into a crafting session was definitely fun! My daughter and I decided to go for a flower in the pot because A. She loves plants and B. It was easy and quick and C. Because this way she can take out a flower, learn the names, put it back into the flower pot, and then choose another flower! Win – Win – Win! We plan on choosing a flower from the pot and learning the names and the meaning of the names from one petal each week. Since there are about 4-5 names on each petal, this seems like a realistic approach. 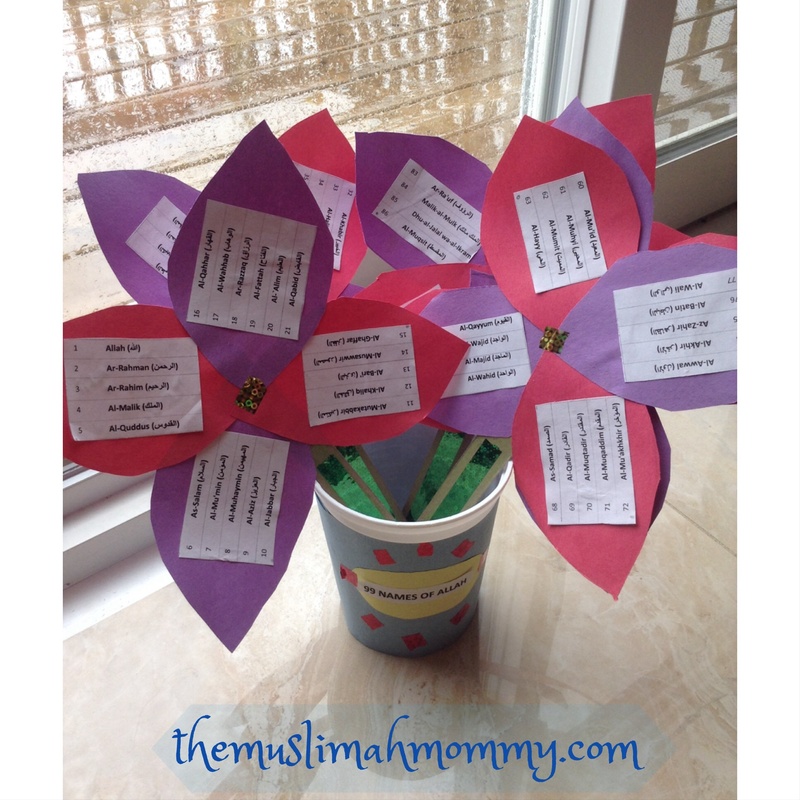 This would be a great craft for children to do during Ramadan while they learn the 99 names of Allah! Print off, or write the 99 names of Allah. 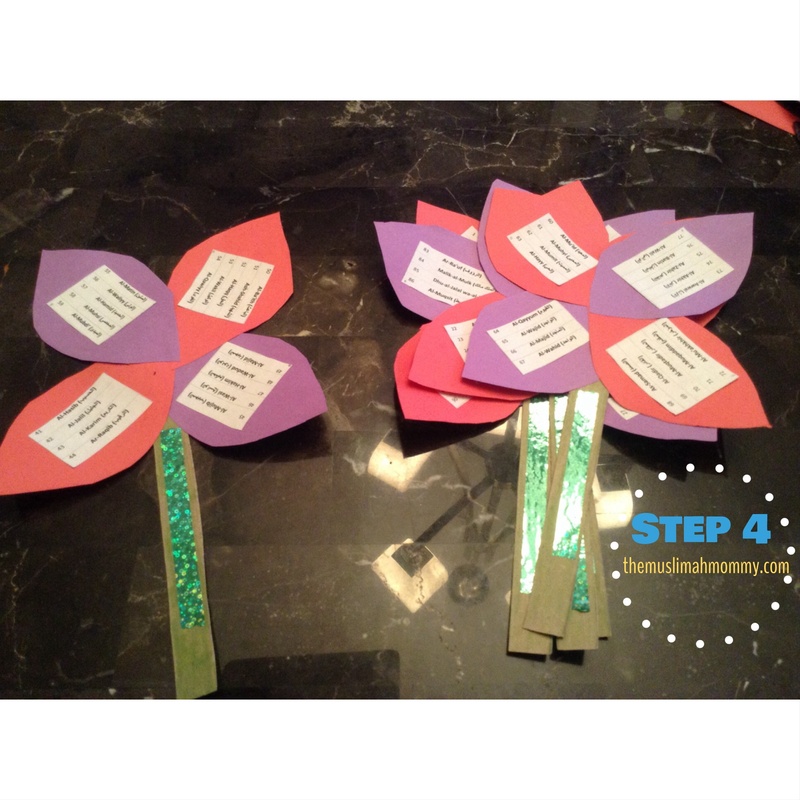 Glue the names onto petals cut out from construction paper. I chose to glue on the names in groups of 4 and 5, thus saving some time. 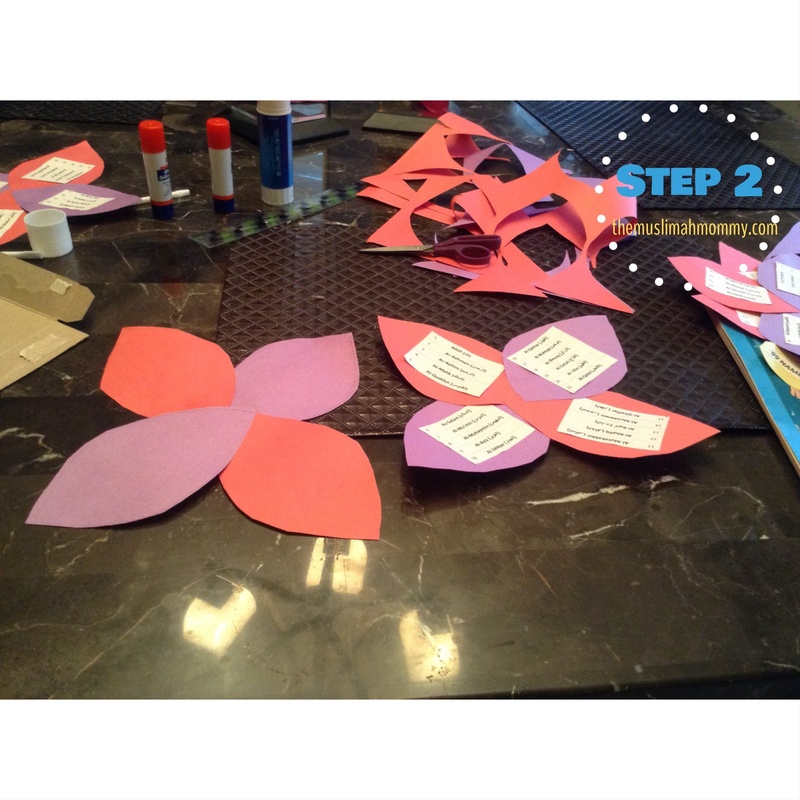 Glue the petals together to form the shape of a flower. 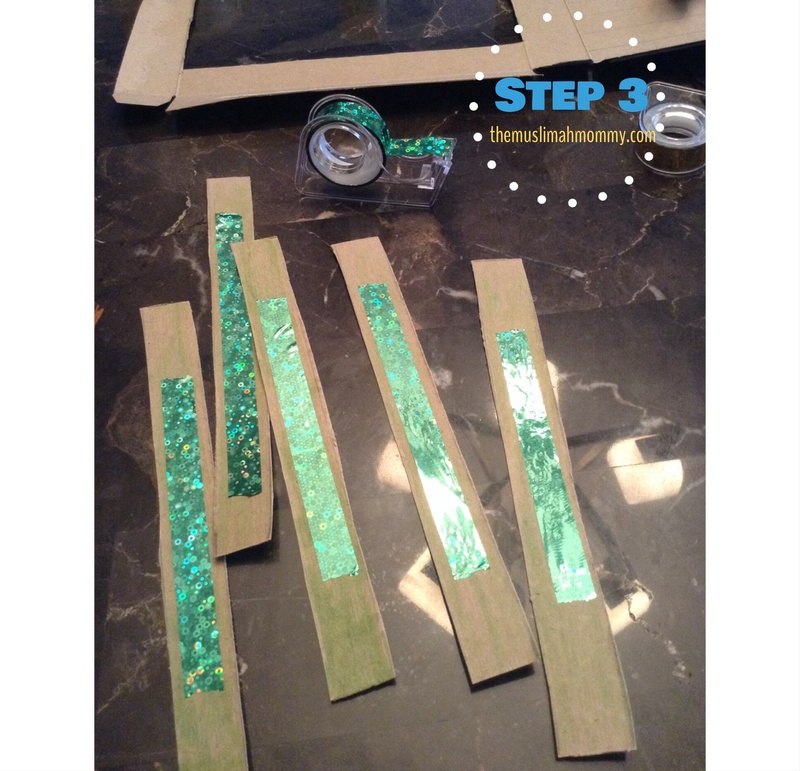 Use a cardboard box (or cereal box) to cut out strips to use as the stems. You can colour the stems green using markers, crayons, etc. We also used some shiny tape on the stems for some sparkle! Glue or tape the stems onto your flowers. 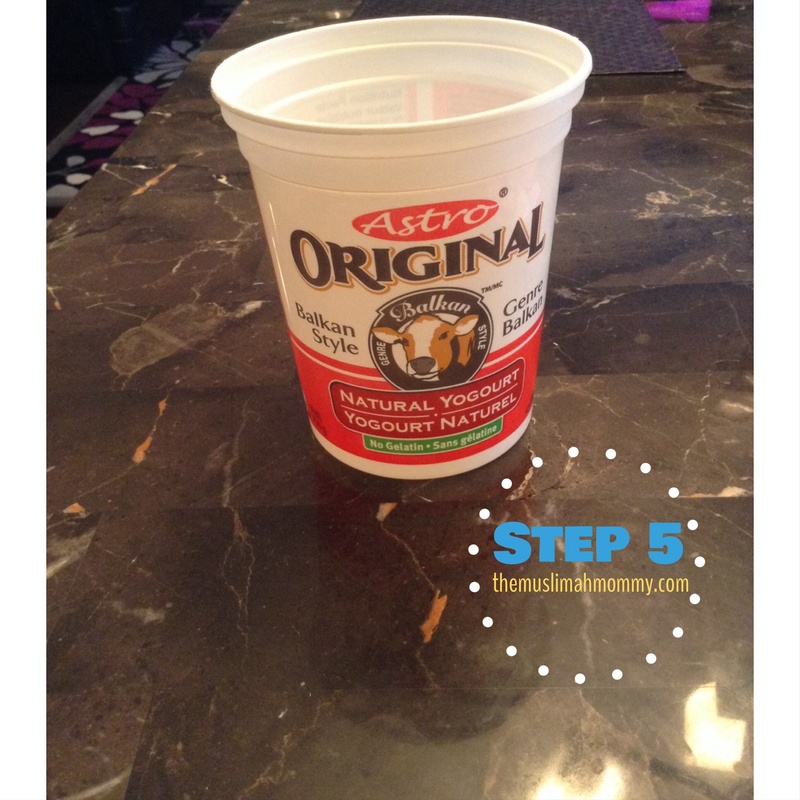 Use a yogourt container as the flower pot. We decided to decorate ours with some construction paper and stickers! 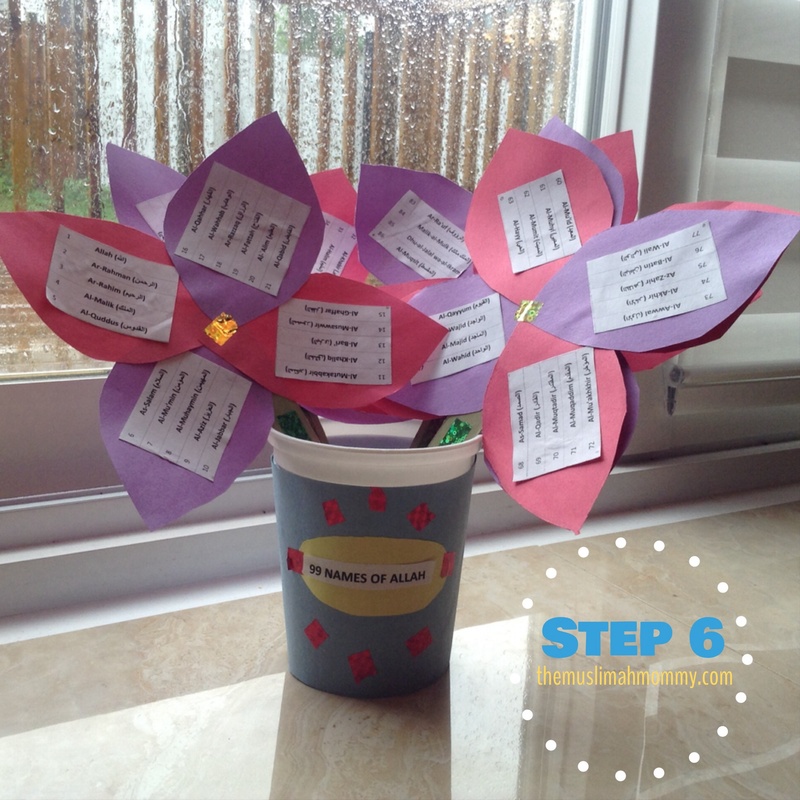 Put the flowers into your pot and start learning the 99 names of Allah! – Materials needed: 99 Names of Allah, construction paper, glue, tape, scissors, cardboard box (or cereal box), yogourt container. Optional: stickers, markers, crayons. -Age: this craft is ideal for school aged children that are able to cut and glue paper. -Duration: up to an hour depending on your child. That’s it! I hope you and your children enjoy this craft as much as my children and I did! My son also trying to memorize Asmaul Husna, but he’s using MP3 player. 😉 Has your daughter memorized it too? Jazak’Allah Khair sis <3 she is just starting to learn the names with meanings, and also learning to read the Quran and memorize so e Surahs Masha'Allah 🙂 Really, the younger they are, the easier it is for them to learn everything, Subhan'Allah <3 Masha'Allah your son has learned just by listening! I'm the opposite, I have to take notes and read over and over again to memorize something; it takes a lot if effort, lol! This is such a great project. It’s especially cool since this year we are in Spring leading up to Ramadan! This could be a cool homeschool lesson incorporating the seasons and Allah as a creator. Mashaa Allah. Love this! Ameen! Jazaki Allah khair for your kinds words sis <3 May Allah continue to shower his blessings upon you and your family!